Tape and Disk Storage: What do They Really Cost? As discussed in the latest BlogBytes post, managing overall storage costs is a high priority for data storage managers in 2017. This BlogBytes post will review total cost of ownership (TCO) variables and how they relate to the holistic goals for an organization. Those in IT management positions at any organization are not only making decisions to manage cost concerns about data storage, but are also addressing storage initiatives like performance, data access, data sharing, security, protection and compliance. Addressing these matters typically incorporates a strategic blend of storage technologies. Each of these storage initiatives can affect the overall cost of managing storage and since cost control is a key objective for 2017, let’s do a more holistic examination of storage cost variables. Cost comparisons have been made between tape media and hard disk drives. Some have argued that tape storage is twice the cost per gigabyte (GB) of SATA HDD storage*comparing the raw media costs of a tape cartridge to an HDD. However, the LTO Program has found that at less than one cent per GB, LTO-7 tape is significantly less expensive than a SATA HDD . Additionally, there have been comments that making a duplicate copy of data on tape can be costly. Although there is a cost when making copies of data on any storage medium, this cost provides the means to address data sharing, Disaster Recovery (DR) and compliance policies. If these policies are not addressed, it could result in much higher costs or other penalties in the event of a data destructive event. The low cost of a tape cartridge makes it an attractive option to duplicate critical data that can easily be moved to a safe, remote location and address DR best practices. Creating a redundant remote disk system would be a more costly undertaking. 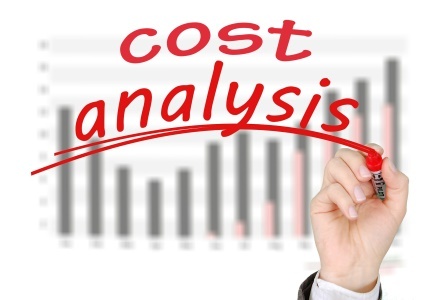 It’s fair to say that simple cost comparisons only scratch the surface of the costs and goals associated with an enterprise storage implementation. Let’s look deeper to discover the real costs related to a Total Cost of Ownership (TCO) assessment. TCO managed by storage executives contains acquisition costs as well as other supportive and on-going costs including: software, infrastructure/energy, maintenance, personnel, migration and data access costs. These variables were included in a ten year TCO study conducted by the Enterprise Strategy Group (ESG) . The detailed economic analysis was designed to help IT organizations compare the fully burdened costs of leveraging modern storage alternatives for long-term data retention. The study compared an LTO tape-based approach with a present mode of operation (PMO) that represents an all-disk storage approach in-house and in the cloud. As described in the report, the LTO tape-based approach showed “an impressive 577% return on investment over ten years when accounting both for avoided costs and net new economic improvements.” The costs for each of the storage variables for each storage alternative are shown in the ESG chart below, with each variable thoroughly explained in the ESG TCO study. 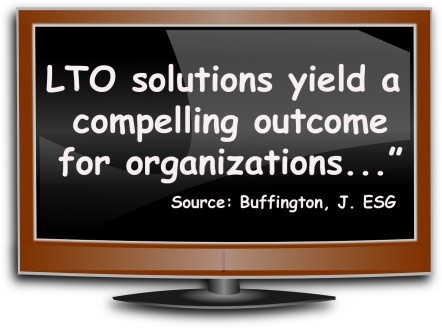 As you can see, when considering all variables that go into an enterprise storage implementation, LTO technology can provide the most cost-effective option. How reliable is LTO-7 tape? The ESG report also drew conclusions about the reliability and usage of LTO technology, “Contrary to misconceptions that tape is an unreliable, slow, and antiquated storage technology ESG is pleased to report that LTO tape is thriving and has a bright future in organizations of all sizes, including some of the largest public cloud providers on the planet. © 1999 - 2018 Hewlett Packard Enterprise, IBM and Quantum. All rights reserved. Information subject to change without prior notice. All trademarks and registered trademarks contained herein are the property of their respective owners. Linear Tape-Open LTO, the LTO logo, Ultrium and the Ultrium logo are registered trademarks of Hewlett Packard Enterprise, IBM and Quantum in the US and other countries.